As a child, just about my favorite thing to do was look at color. In kindergarten, my teacher passed me a prism and I was simply rapt. Nothing was more beautiful to me than standing in the sun, twisting around the triangular glass, and watching the rainbow dance on the sidewalk. Stunning. And they always were. 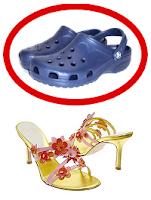 My personal mantra encompassed these colors. Others might pray with a rosary, but my prayer beads were wax cylinders placed in perfect order in a small gold and green box. Honestly, I could rattle off these color names faster and easier than my home address. The 60s Crayola tagline was "They work on brains, not batteries." What a message for today's kids! Watch this Crayola ad from back in the day. 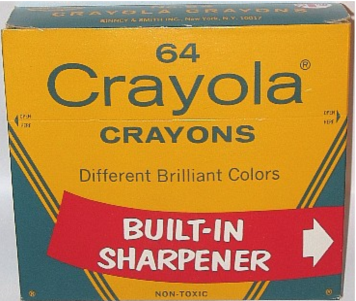 According to Wikipedia, the original color line up for Crayola's 1960's 64-color box was: BLACK, ORANGE, APRICOT, AQUAMARINE, BITTERSWEET, BLUE, BLUE GRAY, BLUE GREEN, BLUE VIOLET, BRICK RED, BRILLIANT ROSE, BROWN, BURNT ORANGE, BURNT SIENNA, CADET BLUE, CARNATION PINK, COPPER, CORNFLOWER, FLESH, FOREST GREEN, GOLD, GOLDENROD, GRAY, GREEN, GREEN BLUE, GREEN YELLOW, INDIAN RED, LAVENDER, LEMON YELLOW, LIGHT BLUE, MAHOGANY, MAIZE, MAROON, MAUVELOUS, MELON, MIDNIGHT BLUE, MULBERRY, NAVY BLUE, OLIVE GREEN, ORANGE-RED, ORANGE-YELLOW, ORCHID, PERIWINKLE, PINE GREEN, PLUM, RAW SIENNA, RAW UMBER, RED, RED ORANGE, RED VIOLET, SALMON, SEA GREEN, SEPIA, SKY BLUE, SILVER, SPRING GREEN, TAN, THISTLE, VIOLET, VIOLET BLUE, VIOLET RED, WHITE, YELLOW, YELLOW GREEN, YELLOW ORANGE. My whole life would have been different if I could have had another 56 colors. I swear it. 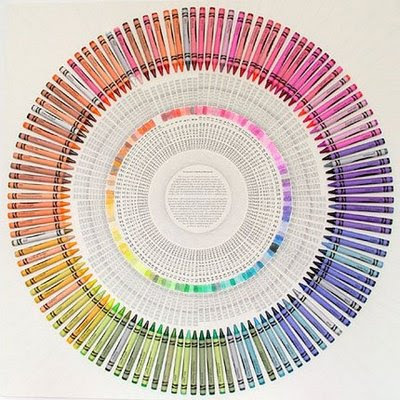 And then there's this: British artist Jamie Shovlin's whirling dervish of a Crayola color wheel. According to David Rainbird, Slovin has sorted his crayons by "hue in an attempt to form tetrads - combinations of colours from four equidistant points around the circle that when combined create perfect greys. There are 720 possible tetrad combinations with this many Crayolas and although Shovlin started the combinations, he gave up after trying out about twenty or so." What a wonder! I'd love to have this hanging in my office offering daily inspiration. I couldn't find a better mandala if I tried. So thank heaven for Crayola crayons. 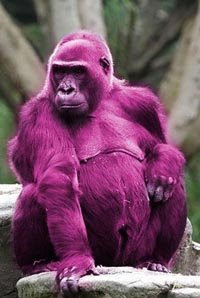 But most of all, thank God for color - all 64 of them in the elusive box set - and every other hue besides. A lovely poem from the May 5th issue of the New Yorker. you must count yourself lucky. to the television and back again. as she approaches the house. from the street to the porch. so she can pick each name at random. but I don’t ask why. the way my brother does when he gardens. all the smoking and all the drinking. and all of a sudden things are feeling romantic. so you feel embarrassed or ashamed of something. 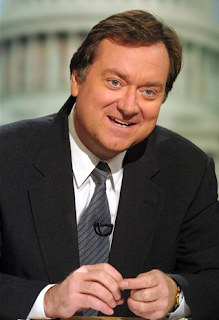 As I blogged yesterday, I am in love with Tim Russert and always will be. This evening, I watched his beloved son, Luke, being interviewed by Matt Lauer and remembered what it was like for me losing my mom at such a young age. I don't think I could have been half as gracious and articulate as this young man. Saying Luke is a credit to his parents is an incredible understatement. I look forward to watching Luke take the stage - whatever that stage is - because no matter what he does, he will be a success. What a great kid. In case you missed it, here is the interview. I never met Tim Russert, but I feel like I've lost a member of my family. I've been in love with Tim Russert for years. He was my dream man. If I'd won a contest that would have let me eat dinner with anyone alive, it would have been Tim Russert. I've always thought he would have made me a great husband: kind, loving, and focused on family, he was also a consumate and creative professional who was dedicated to his craft. I know I could have been happy if I'd only married Tim Russert! I am an MS-NBC addict; during the day, I watch nothing else from the time I get up in the morning until I stop work. So when MS-NBC came back from a commercial break playing that God-awful special report music, I expected that the network would report on the Afghanistan jail break that had just occured where 40 Taliban members had escaped. I mean, that's a huge story, right? When I looked up and saw Tom Brokaw, I knew the news was even worse - and indeed it was. When Brokaw reported that Tim had died, my heart stopped and my tears began. How could it even be possible that he had died? My phone rang a few minutes later and my boyfriend, Tom, said he had some very bad news that he wanted me to hear from him first. I was crying already, so he knew that I had heard about Tim's death. It meant the world to me that my beloved boyfriend would want to break the news to me gently about the loss of someone I really loved. I am grateful that MS-NBC has devoted all of its coverage since then to remembering Tim Russert. I can't watch enough. The world is in mourning and I need to participate. I am particularly thankful for Wolf Blitzer; when I left to visit Tom in Southern Maryland yesterday afternoon, I couldn't listen to MS-NBC because it is not on XM Radio. But CNN is, and was doing what everyone else was doing: mourning Tim Russert. Wolf Blitzer spent hours with journalists and politicians talking about the death of his greatest rival. That's real class. I'm a but drop in an ocean of people who love and mourn Tim Russert. Politics and Washington and journalism and Buffalo and NBC and indeed the world will never be the same. God bless Tim Russert and his family. He will always be missed. My beloved brother and nephew have declared me a lazy blogger - and they're right. 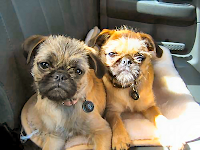 To repent for my sins and to celebrate the universe's diverse design sense, I offer Round 2 of Wacko Pugs. 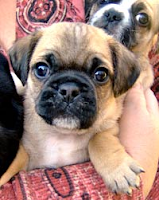 (You might also want to check out Wacko pugs, installment 1). 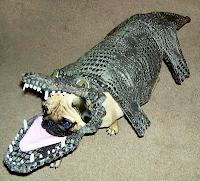 And finally, here's something I bet you'd never see: a crocodile/pug mutt!